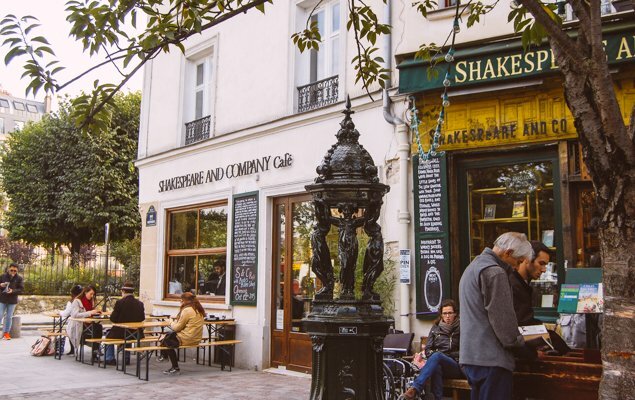 Shakespeare and Company, just a few short steps from Notre Dame and living on in the hearts of literature lovers all over the world, is a must-stop on any Parisian adventure. After living here for quite some time, I still find myself wafting into its friendly doors. And this summer, Shakespeare and Company is offering more than an incredible array of books: from classics to poetry and plays to iconic books like Hemingway’s A Moveable Feast or Joyce’s Ulysses—published there by the original owner of Shakespeare and Company! This summer Shakespeare and Company have been offering Shakespeare in the Park and various Shakespearean reading events. Recently, as I waited to buy a book, an employee at Shakespeare and Company whispered this information over to me: “Macbeth. This evening. Six Thirty.” It felt like entrance to a secret club. 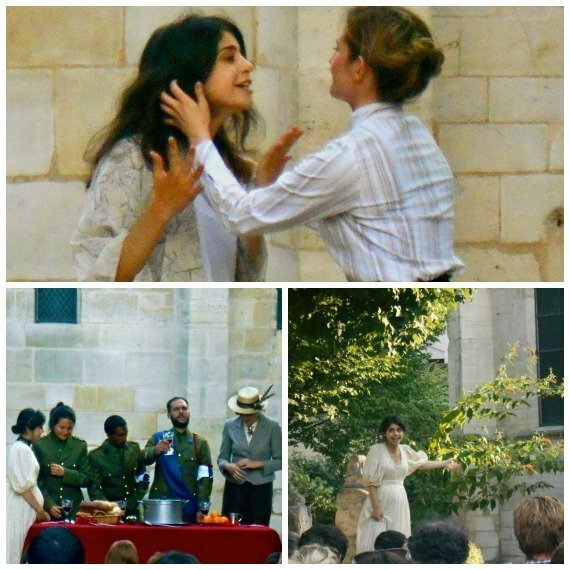 Macbeth in the Park was held through Shakespeare and Company’s Bard-en-Seine festival, a celebration of Shakespeare’s 450th birthday. It had been a few years since I’d read the play: a play pulsing with murder, grand monologues, insanity and, of course, ghosts! The play was positioned in the park just east of Shakespeare and Company in the great southern shadow of Notre Dame. With the backdrop of an ancient church, marvelous performers created an entire Shakespeare world while the onlookers crowded around in both seats, on top of rocks, and standing. The three witches whispered the words: Something wicked this way comes! and us 21st-century-ers were transported into a different world. Note: the photos portray the Shakespearean-age characters in World War I garb to commemorate the 100-year anniversary. 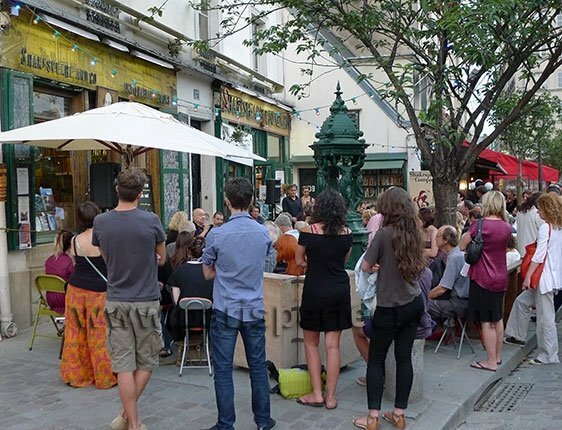 The Shakespearean Readings, an extension of this Bard-en-Seine celebration at Shakespeare and Company, take place at the end of the months of July, August, and September. The bookstore hosts people for an informal read-through of various plays to celebrate the joys of Shakespeare’s words. The end of July brought a read-through of A Midsummer Night’s Dream. On Thursday, August 28th there will be a read-through of Othello, while the end of September offers The Merchant of Venice. If you’d like to be a part of these events, make sure to contact Shakespeare and Company via email. Alternately, listen to the recorded podcast! If you’re lucky enough to have little story-lovers, head to Shakespeare and Company on September 22 or September 24 for Children’s Hour. Kids 2-6 years old are welcome for an hour of storytelling and singing. Your child can choose from an array of fun instruments, and truly feel a part of the Shakespeare and Company magic. Another generation of book lovers off the banks of the Seine! The Theatre de verdure du Jardin Shakespeare is an open-air theatre tucked in the massive park on Paris’ western side. The theatre seats about 300 guests and features several events throughout August and September. The ambiance and greenery brings vibrancy to the performance; and the French language lends a backdrop of culture. Hansel et Gretel and Quel Cirque!!! are both excellent for children, while Les Precieuses Ridicules, by Moliere, is perfect for adults. Check out the schedule on the website. Paris Lit Up: Drop In Weekly Writers Workshop is perfect for the traveling writer. The Apparemment Café in the 3rd arrondissement is the meeting place for these writers, who come together to drink espresso and discuss the intricacy and beauty of a sentence. Bring anything you’re working on: from poetry to prose, and enjoy the relaxed, literary atmosphere in the very city that inspired so many. Note: the writer’s workshop meets once a week on Saturdays, from 4 p.m. to 6 p.m.
As you wander through Paris, you’ll find countless little bookstores with plenty of English options as well. Find used books for no more than €5 and head to a peaceful garden near your apartment. Alternately, grab your notebook and head to one of Hemingway’s favorite writing spots – Café Flore. Paris’ literary history is alive, and you’ll find yourself in its remarkable, dreamlike cloud. Allison Krupp is a Midwestern-born traveler who ran away to Paris when the snowstorms swooped in. These days find her exploring Paris’ arrondissements, speaking poor French to people she hopes appreciate the sentiment, searching for the best bottle of wine and discovering all the mystery of this historical city she now calls home. Posted on Thursday, August 28th, 2014 at 2:37 pm in What's On. You can follow any responses to this entry through the RSS 2.0 feed. You can leave a response, or trackback from your own site. Shakespeare and Company Literature Walking Tour in Paris: Follow in the Footsteps of the Greats 5 Bookstores Every Book Lover Should Visit In Paris Shakespeare & Company Café: Books + Coffee = A Match Made in Heaven!